Each tubing set is equipped with flare nuts on both ends. Both liquid and suction lines are insulated. Tubing sets can be joined together with field supplied double female flare connectors. Each ductless mini-split system requires one tubing set. Line sets consist of two semi-flexible copper pipes to connect the outdoor air conditioner or heat pump to the indoor evaporator coil. The smaller pipe is called the liquid line. The larger pipe is referred to as the suction line, and includes insulation. Line sets come in several lengths and are designed to be cut to fit your exact need. We offer line sets for both standard central air conditioning systems and heat pumps, as well as mini-split systems. Mini-split line sets can be used with any brand of mini-split equipment. The liquid line diameter for all standard residential systems is 1/4'' -1/2 inches in diameter. 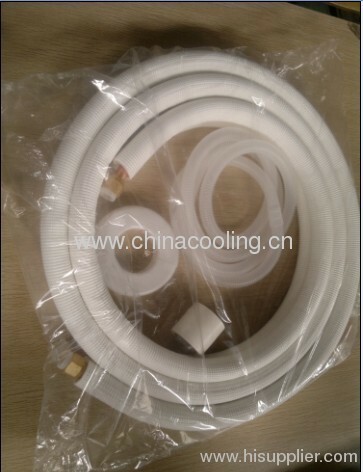 The suction line diameter will be either 3/8 ,1/2 ,3/4, 7/8 or 1 1/8 inches, depending on the size and efficiency of the air conditioner or heat pump. Line sets come in several lengths and are designed to be cut to fit your exact need. When purchasing refrigeration lines, measure the length of line set needed to connect your outdoor condenser to the indoor forced air equipment. Based on that length, the correct size diameter line set can be selected which will ensure your system meets the listed SEER rating and capacity. Once you have accurately measured the length needed, use our chart below to find the diameter best for your system.